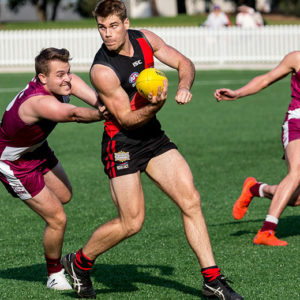 A different look Macquarie University outfit came away with a narrow five-point win on the weekend against Newtown at Mahoney Park on Saturday night. 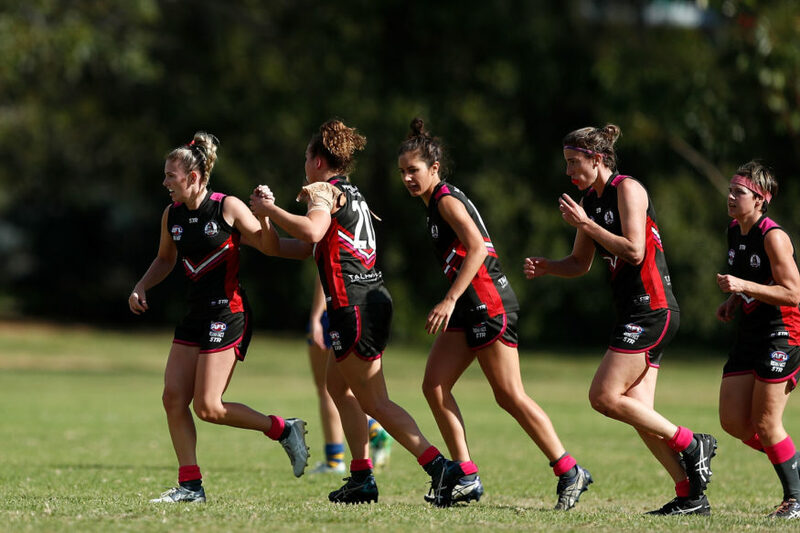 The Warriors had six of their key players away in Brisbane representing the Northern Giants in the AFLW Winter Series, which provided an excellent opportunity for their remaining players to step up in their absence. And step up they did through the likes of Aislinn Albury, Gabrielle Ferreira and Eleanor Dalgarno Fixter. Albury was best on ground for her side kicking two of the Warrior’s three goals. Ferreira played half forward and provided pace and class when delivering the ball inside 50 and Dalgarno Fixter did an excellent job in the ruck. But the game definitely wasn’t one sided as Newtown looked to make the most of the depleted Warriors outfit. Alex Schroder had an enormous amount of possessions and was assisted by Francesca Hocking who continually cut the ball off on the half back line to transition her side from defence into attack. Goals were hard to come by in what was a contested match with numerous stoppages. Both sides were only able to manage one goal each in the first half. The Warriors’ came through Ferreira who marked 10 metres out in the forward pocket. For Newtown, it was a snap around the body from sneaky forward Cody Briggs who delivered the ball to teammate Claire Groom. Groom kicked the goal from short range. In the second half, Albury made an impact on the scoreboard for Macquarie kicking two goals in the third quarter. Both goals came from contested marks and set shots in front of goal. Newtown got their second from what was probably the play of the game. Schroeder soccered the ball deep into their forward pocket where it was gathered by Catherine Lee. Lee picked up the ball, gave her opponent a “Dusty don’t argue” and kicked the ball to the top of the square where Groom took a mark straight in front, played on and kicked the goal. There was a goal separating the two sides heading into the final quarter and the Breakways had the momentum. Unfortunately despite having a number of opportunities, their side wasn’t able to capitalise. Briggs started to have an impact after Elizabeth Graham had done an excellent job of holding her all day. Briggs had a number of shots on goal but was unlucky not to score a major. Macquarie University coach Dan Ranson was impressed with his side on the weekend. “We’ve got a lot of depth this year. 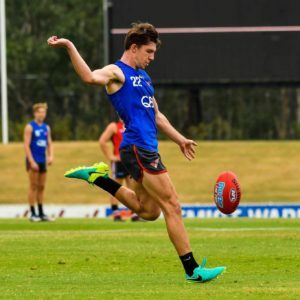 We have a few players who want to play in the midfield who have been playing either in defence or forward and they got the opportunity on the weekend. I actually thought our midfielders did really well. Ranson was especially impressed with Albury’s game. The win takes Macquarie Uni’s undefeated run to 10 games in a row, but Ranson explains that he thinks at times his side has been lucky. 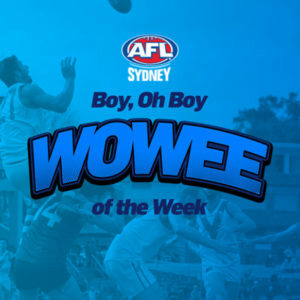 In other matches, the Western Wolves (9.12.66) are back on the winners list after an impressive 48-point win over the Sydney University Bombers (3.0.18). The Auburn-Penrith Giants (4.3.27) came from behind to beat the Southern Power (2.9.21). 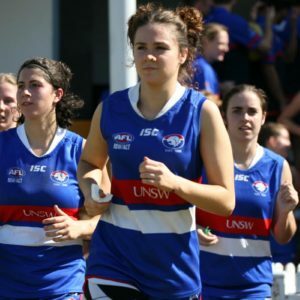 UTS Shamrocks (6.3.39) caused an upset defeating the UNSW Eastern Suburb Bulldogs (2.7.19) by 20-points.